The Ascent vaporizer, IQ‘s older sibling made by manufacturer DaVicini, offers cutting edge technology, high quality parts, and impressive features at an affordable price. Compatible with vaping both dry herbs and waxy concentrates, the Ascent is equipped with precision digital heat setting controls that are easily operated. This unit also comes with a mouthpiece made from glass that is removable for carrying purposes, minimizing breakage and damage. In addition, the vapor travels down a path that is all glass, which vapor enthusiasts know provides the smoothest, tastiest hits money can buy. 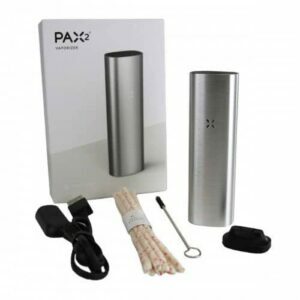 The heating element made from ceramic also adds to the top-notch vapor quality on this unit. The Ascent comes with not one, but two powerful batteries made from lithium ion. You can recharge both batteries and swap them out anytime, and you’ll get about 2 to 3 hours of vaping from them. In addition to all of this, the Ascent also looks slick, feels nice in the palm of your hand, and is as about as discreet as you can get while still delivering robust, tasty vape rips. With the DaVinci Ascent the pathway that the vapor travels down is made from all glass, which means you will get a tasty, delicious hit every time, as long as you maintain your unit. Metal or plastic vape paths can get in the way of your vapor taste, but that is not the case with the Ascent. The vapor path made of all glass is also a breeze to clean and upkeep. The heating element on the Ascent is made from ceramic that is also lined with glass, which results in even heating of your dry herbs and wax, which means delicious vapor flavor and minimal harshness, even at the highest temperatures. The mouthpiece on the unit is also made with high quality glass that is easily kept inside of the unit for safe traveling. The Ascent comes equipped with an impressive LED display that represents your heat settings and battery life digitally. The display is bright easy to read and lets you get the most out of your unit. When you power the Ascent on, there is a welcome screen that pops up, and after that it will tell you how much battery juice you’ve got left and also indicates what heat setting it’s currently at. This LED display allows you to select your temperature at 1-degree intervals, meaning you get to experiment until you figure out exactly what temperature is right for your vaporizing preferences. In addition, the device can change from degrees Fahrenheit to degrees Celsius, depending on your preference. The Ascent also features a pretty unique and option to decide your specific heat settings and how long you’d like the unit to operate for your dry herb or waxy concentrate vape sessions, meaning you’ll save on battery life. The digital display on the DaVinci Ascent is one of the best currently available. The Ascent heats up and is ready to use in less than a minute. Just pick your preferred heat setting and wait about 50 seconds typically. Even the highest setting of 221°C only takes about a minute and a half. This is perfect for vape users who don’t want to wait or need fast and efficient heating because they have only a small opportunity time to take a delicious vape hit. You can also set the timer on the unit to prevent the auto-shut off feature. These excellent, fast heat up time and additional features just add more value to an already exceptional portable vaporizer. The Ascent boasts a unique, programmable temperature interval feature that enables users to toggle through heat settings without even pressing any buttons. For instance, you can set the unit to operate at 185° C for 2 minutes, and then jump up to 190° C for another 2 minutes, and then finally end your session at 196° C to make sure you’ve gotten the most out of your dry herb. Waxes usually perform better at the higher temperatures, as this unit can reach up to 220° C. This gradual temperature increase is perfect for evenly and efficiently vaping your herb or wax. If you’re the type of vaporizer enthusiast that prefers exact temperature control, you can do that as well by simply pressing the up and down buttons. You will have no shortage of options when it comes to heat settings on the DaVinci Ascent. In addition to all glass vapor path and customizable heat settings for optimal flavor and smoothness of your dry herbs, the Ascent can also vape wax concentrates using one of the glass concentrate jars. These glass jars keep your dry herbs and concentrates apart from each other, which increases cleanliness and makes the unit easier to maintain. When using the Ascent for vaping wax concentrates, you will need to use the higher heat settings than that of your dry herbs. Although it works quite well with your favorite waxes, The Ascent does not vape liquid concentrates.